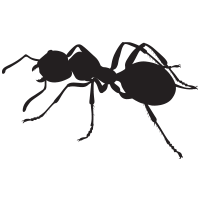 Ants can be a real problem in and around any residential or commercial dwelling. They are often seen swarming over recycle bins, in the kitchen and/or pantry, actually anywhere food is stored, consumed or prepared. You are right to assume they are attracted to all sugary substances. White-footed house ants. Ant baits will not effectively control this type of ant. Urbanisation contributes to ant populations. As humans populate regions, concrete paving is incorporated into most residential areas. Inspect concrete surfaces and its likely ant trails will be visible. Ants love concrete; for concrete creates large unobstructed runways leading invariably to food sources. If you have an infestation of ants, one of the species commonly responsible is the White-footed house ant (Technomyrex jocsus). White-footed house ant colonies congregate in a variety of locations. Colonies are likely to contain millions of ants. Those which are visible are a very small percentage of the over overall colony. They prefer areas where there is some protection from the extremes of the outside environmental, particularly within a building’s structural cavities. Often ants are found around electrical power points or switch boxes. This is because ants use electrical wiring as ant 'highways'. More often they will be found living either behind and under kitchen cupboards, close-by food sources. Just when you think you have found the location of a colony, it may be that there exists several satellite nests within the building or surrounding area, all interconnected. Some extend as far as a neighbour’s property, even well beyond. More recently Argentine ant (Linepithema humile) has become a problem, mainly along the coastal regions where there are sandy soils. This is particularly so in the Raumati, Paraparaumu, and Waikanae beach areas. These ants are very invasive and will often come inside during wet weather. Targeted treatments to control Argentine ants are different than for other ant species. Another ant species, Darwin's ant (Doleromyrma darwiniana), is also becoming more of an issue in the region. While both Argentine and Darwin ants look similar (to the naked eye), a microscope is necessary to distinguish between the two species. Correct identification of any ant infestation is essential for correct control. If you have an ant problems, we can help identify the ant type for you. Contact us and we will arrange an inspection and identification service. The best solution to an ant infestation is to create an environment that ants will dislike and avoid. Whilst we provide a full pest control service and use a wide variety of treatment techniques we can't always guarantee the total elimination of ants after one visit. Re-infestation is common because there is a high likelihood that colonies located in and around neighbouring buildings will reinvade your property. This makes ants a problem pest to eliminate and its often beneficial to involve your neighbours in an ant control programme as well. As ant control is very difficult we will always suggest a longer-term monitoring and control plan. To discus any integrated ant control strategy and to conduct an initial inspection, contact us at Nature's Way Pest Control.